Unless you live in the tropics, winter is likely to bring uncertain weather, including bone-chilling temperatures, severe winds, freezing rain and significant snowfall. Needless to say, such conditions are not much fun under the best of circumstances. If there is no power and no heat, the effects of winter are magnified, especially for those that have failed to prepare for extreme weather events. Being prepared for winter weather conditions is not rocket science and there is much you can do to ensure the safety of your home and family during the winter storm season. 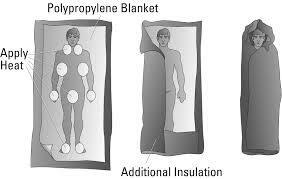 Having an alternate heat source is a good start as is plenty of warm blankets and clothing. Even with these precautions. it is still likely that the cold will get to you, especially if you have to spend time outdoors clearing debris, shoveling snow, or simply walking your dog. Hypothermia can be deadly so the more we know about it the better. Of course educating yourself regarding the effects of extremely cold weather on the human body is an important step to take before the icy cold weather sets in. That said, it is never too late to become informed, even if you are currently in the midst of a snow storm or a blizzard. Today it is my pleasure to share an article written by Joe Alton, M.D., who, with his wife Amy, share their extensive medical knowledge at their Doom and Bloom website. As licensed health care practitioners, when they have something to say about survival medicine, I listen. 1 I Live in a Warm Climate – Why Do I Need to Learn This Stuff? 7 Shop Emergency Essentials Sales for Fantastic Deals! I Live in a Warm Climate – Why Do I Need to Learn This Stuff? Gaye: I understand the dangers of hypothermia for those that live in colder climates. But what about everyone else? Why should they pay attention and be concerned as well? Joe: Few people realize that they are in danger of becoming hypothermic anytime a large percentage of their body’s surface area comes in contact with temperatures lower than the body core. If you fell off a boat in the Bahamas into 82 degree F water, you would eventually succumb to hypothermia if not rescued. You only have to drop to 95 degrees F to feel the effects of hypothermia. 1. Take off wet clothing. If the person is wearing wet clothing, remove them gently. Cover them with layers of dry blankets, including the head (leave the face clear). 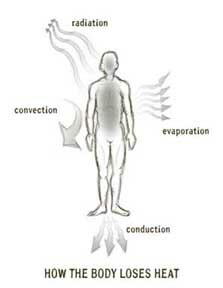 If you are outside, cover the ground to eliminate exposure to the cold surface. 2. Monitor breathing. A person with severe hypothermia may be unconscious. Verify that the patient is breathing and check for a pulse. Begin CPR if necessary. 3. Share body heat. To warm the person’s body, remove your clothing and lie next to the person, making skin-to-skin contact. Then cover both of your bodies with blankets. Some people may cringe at this notion, but it’s important to remember that you are trying to save a life. Gentle massage or rubbing may be helpful, but vigorous movements may traumatize the patient. 4. Give warm oral fluids. If the affected person is alert and able to swallow, provide a warm, nonalcoholic, non-caffeinated beverage to help warm the body. Remember, alcohol does not warm you up! Don’t give alcohol. 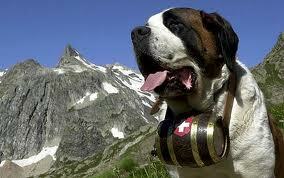 You have all seen photos of St. Bernard’s with casks of brandy around their necks for lost alpine travelers. Alcohol may give you a warm and fuzzy feeling, but it also expands blood vessels, which causes heat loss! Bug out strategies, survival gear, emergency food storage and water purification are the bread and butter staples of prepper-oriented websites. But being prepared involves so much more. Sometimes we have to move beyond the fluff and the easy stuff. We need to stay educated about the hazards of daily life; hazards that will be magnified 100-fold following a disaster or other emergency. I would like to thank Joe and Amy for allowing me to share their article and especially for the outlining strategies to treat a suspected case of hypothermia. Having this knowledge could save a life. Be well and be safe everyone. Bargain Bin: Getting the goods you need to in place to be comfortable during a power outage when the grid is down can be daunting when you are just getting started. Always, start with food then branch out from there. Here are some items to help you along the way. The Survival Medicine Handbook: A Guide for When Help is Not on the Way : This book will teach how to deal with all the likely medical issues you will face in a disaster situation, and including strategies to keep your family healthy even in the worse scenarios. It covers skills such as performing a physical exam, transporting the injured patient, and even how to suture a wound. This medical reference belongs in every survival library. Ambient Weather Emergency Solar Hand Crank Radio : This is becoming a popular choice for Backdoor Survival readers. This unit is a Digital AM/FM NOAA Weather Alert Radio and a powerful 3 LED flashlight, with smart charger, all in one portable package. AA and AAA Solar Battery Charger : Another popular item. This unit will charge up to 2 pairs of AA or 1 pair of AAA batteries via USB or solar power. Coleman Rugged Battery Powered Lantern: This sturdy Coleman has a runtime of up to 28 hours on the low setting and 18 hours on the high setting but does require D cell batteries. Personally, I have both a battery operated and propane lantern. Of course, by now you know that I like redundancy with my preps. Dorcy LED Wireless Motion Sensor Flood Lite : Don’t let the $20 price lead you to think this wireless flood light is wimpy. I have two of these (so far) and feel that these lights are worth double the price. Chemical Lighting aka Light Sticks: These are inexpensive, portable and easy to use. These come in a number of colors so take your pick. I am one of the “lucky” ones who lives in a tropical climate. We moved to Panama 4 months ago. I used quotes around the word “lucky” because I think it is all a matter of perspective. This was my husband’s dream to move here. (here is a link to one of our neighbor’s houses — //trypanama.com/listings/beach-home-in-country-with-pool-on-malibu-beach-0020/ ) There are huge mansions, modest homes – we live in a modest home — and then shacks, all right next to each other, something you don’t see in the U.S.) We are two blocks from the beach. I say this and linked to the picture of my neighbor’s home to show you how beautiful everything is, BUT…. I miss the U.S. VERY MUCH. I am so homesick. I dream about temperatures in the freezing range. I want to roll around naked in the snow (ok, so maybe not naked). I am too hot, ALL THE TIME. I am 38 years old and figure this is what constant hot flashes of menopausal women must feel like. My husband keeps saying “you will acclimate” and encourages me to turn off our AC. It is gorgeous, sure. I will give you that. But my family isn’t here. The people are nice, for sure, but they are not like-minded preppers like me. The closer you get to the equator (we are just a mere 8 or 9 degrees north of the equator) the less long term thinking is done. The folks here don’t care about what they will eat tomorrow, or next week. If they are hungry, they will just go fishing. This freaks me out. I sold my 2-year supply of food storage for about 50% off — all my MREs, my J-A-W meals, my dehydrated and freeze dried ingredients, cans from the LDS cannery, most of my prepping gear. We did bring our bug-out-bags and a few buckets of JAW meals. But that is it. We may have enough food in our home to last a month if we rationed it…. and water…. well, we are on a well but don’t have a storage tank. That is scary in and of itself because we are reliant on electricity to pump the water. So…. I think I would face the elements and the freezing temps if I had a choice… vs. this “tropical paradise”. It is really not a good place to be for preppers. (Food doesn’t last long — my kitchen is 85 – 90 degrees) and there are BUGS EVERYWHERE! I do hope you get over your homesickness soon, Rebecca. I’d trade you my snowy -45 degrees with windchill – any day – for being hot all the time with bugs everywhere. To calm your nerves about not having a stockpile of ready to eat food, do you try to be aware of everything around you that is eatable? I don’t intend to gross you out or anything, but, just how many of those bugs are possibly tasty? Are they self-rotating canned goods with legs delivered right to your front yard? What about wild plants? I might also suggest trying to embrace the minimalists of it all? I sure would like not to have to have all the coats, hats, boots and coveralls in order to get through a freezing day. I’d like not to hear that low moaning sound a car makes when the battery is too cold to turn the starter. I’d bet that a good knife is something to value down there. Do you know how to use one? Do you BBQ? If so, you could focus on maintaining a nice pile of wood. Do they have mesquite down there? Have you gone to the beach and practiced catching condensed water with a hole and some plastic? Anyway, thanks for sharing a bit of your life. It’s something to consider, and something I’ll likely not soon forget reading. It was a bit funny too, heh, RE: ‘rolling in the snow’. We have a very sharp machete. Although I do feel very naked without my guns. For some reason I always slept better knowing my 9mm was loaded, in my bedside drawer. I have a ton of herbs and essential oils to combat illness and infection. I don’t know about edible bugs but there is a lot of wildlife. If we can catch squirrels and such. Everyone here has the Manana attitude (do it tomorrow) and that is so not me… I don’t feel comfortable with that attitude. I like to be responsible and plan things out. Oh well. I am flying back to the states in a couple weeks (Minnesota of all places) so I am sure I will get my share of my tootsie being frozen off. lol. I am looking forward to eating at some real restaurants. Panamanians are NOT known for their cuisine, I tell ya. We may have gorgeous beaches but the food is lacking in flavor. Rebecca, I know what you mean about central America. I have traveled to Belize quite a few times and have met with relators, but when it come down to not allowing me to pack my gun, I backed out. My family says I am paranoid (I wont go on any more cruises) because I refuse to travel anywhere that wont allow me to conceal carry, that means all of the west coast states and most of the north east coast. Be aware of what Roth says about the bugs. I have an aquarium full of meal worms. I breed them and they go well sautéed in garlic and butter, at least that is what I tell my grandchildren. They don’t seem to want to eat at grand dad’s house anymore. Don’t think that “don’t give a darn” attitude is restricted to Panama. It seems to be that way in Ky also. I’m envious of you. All those fruits growing in your yard. Do you have different seasons that close to the equator? We have wet season and dry season. The dry season is upon us now. Less humidity but higher temps (by about 5 degrees) and more winds. Strong sun shining down. The temps don’t vary much at all throughout the year, maybe 5-10 degrees F mostly. We even thought of Belize to move to… but the infrastructure was not secure there. No reliable internet. That was one of the main reasons we chose Panama. Oh, and the banking here? It is supposed to be one of the global banking centers in the world. Ha! What a joke. Back in the day they got that label, and stuck with it…. although never changing anything to adapt to modern technology. It is crazy. We have tried all the fruits (and eat them a lot) except the Noni. I know it is a superfood but you have to ferment it for a few months and it is disgusting. They have a fruit here called the cherimoya, which people call the “ice cream fruit” as it tastes like ice cream. I have not tried it yet but my friends here have a ton of trees in their yard. I hope to try one this weekend. Rebecca, you are still trying to make me jealous, and you are succeeding. On my trip to Belize to see the relator, we went to the side of the country that the normal tourist doesn’t see. It was scary when you looked up the road, as we traveled, and would see a check point. The soldiers there had AK47’s. The relators said “not to worry. They are just checking to see if we have a sticker on the car”. SAY WHAT? AK47’s to check to see if we had a sticker. I still felt uneasy as he looked me over when we stopped. I guess this was another reason I decided to stay in the states. We don’t have stickers in Ky.
haha your story made me laugh a little. The guards have AK47s here in Panama too. They are at the stores, malls, etc. At first it made me uneasy but then I realize that there is a lot of petty crime here (thefts, stealing) and while it may be overkill, those guards are here to protect us (gringos mostly) because we (ex pats) put a lot of money into the local economies, and when complaints of robberies got to be too high, the government did something about it… these guards are there to make sure we are safe. I wave to the guards, they have helped me out when my car broke down, and I feel safe around them now. But I have never heard of a sticker being needed? I know that I always have to carry a photocopy of my passport and the page of my passport stamp, and show that at any time I am asked. Maybe the sticker is the registration sticker of the vehicle? Here we also have to carry registration, insurance AND the vehicle inspection report in our vehicles, required by law. And, if we don’t have residency (which we don’t) and are on tourist visas, we have only 90 days from the date of entry into the country to drive on our US license. Otherwise, our car can get impounded and we spend the night in jail. So many gringos take turns doing border runs to Costa Rica, and then copy their passport stamp and hand it out to their friends. My husband did his border run a few weeks ago, and I am using his stamp until I leave the country in a couple weeks for a business trip. If we don’t drive, then we have 180 days to stay in the country until we have to leave again. And, to get into the country we have to show proof that we have a ticket to leave the country, that is paid for. I doctored my plane ticket up and copied it for my husband for his border run last month. Very weird. We have never had to pay any bribes yet. And never got pulled over but we have had to pass the checkpoints (maybe for them to make sure we had a “sticker” lol. It does make me feel uncomfortable, but not as much as the US government does! Oh thank you Rebecca. I am no longer envious. I am old and forgetful. I would screw something up and go straight to jail. I wont pass go and I don’t have $200 to pay the bribe. And yes. The sticker was to show the vehicle was use for commercial purposes. A realtor with a gringo. Rebecca – I’m one of those people that northerners find a bit strange. I prefer warm temps (warm – not hot). I also know that without electricity you can burn wood to stay warm, but I’ve never found a wood burning air conditioner! One note about your trip, be sure your immune system is at peak. We don’t want you to get sick from the sudden weather differences. When I was in the US Navy we had some Panamanians that I was talking with. They said when they joined the Navy they were sent to the Great Lakes boot camp, where they immediately came down with double pneumonia! Otherwise – have a great and enjoyable trip! I was over by the Army/Navy store last week. I thought as long as I was there with nothing to do, why not. OK, now the little sales girl, looked to be about 20, was the spittin image of my daughter at that age. She could have sole me anything. Since it was suppose to go below zero for a few days, I looked at warm clothes. She shoved me towards what looked like a black long-sleeved pullover. $15. She said it was what the Army used now instead of long johns. She said it was made of polypropylene. I brought if and a long, down to my chest, sock hat. Ok, now in Ky, 2 degrees below. I’m out trying to keep my critters warm. I’m doing ok. It is beginning to feel warm. Now hot. Unzip the coat. My, this thing she sold me is hot. I suppose the next time I am by the store, I will buy the bottoms to the top. Polypropylene is the way to go. Write that down. This has been so applicable lately in NYC. Hope that not for long. For the last few days I was wearing my hunting clothes anytime I had to leave home. I was in New Mexico at the Carlsbad Caverns on a day when the outdoor temperature was over 100 F.
There were signs at the entrance to the caves advising people to dress warmly and to at least have a sweater handy. I disregarded the advice looking forward to the hour or so I had planned to spend spelunking (that’s what cave exploration is called), a time I looked forward to for cooling off. I was wearing shorts and a t-shirt and sweating profusely. Not too quickly, but nonetheless fast enough, I learned that the steady underground air temperature in caves is about 55 F. After about 30 minutes of spelunking I was uncomfortably cold. After 60 minutes my teeth were chattering, I was becoming incoherent and confused as to how to get out of the cave. I started fantasizing that the cave tour guides had turned the AC on to make themselves comfortable in their official uniforms. I was so disoriented I thought I was coming down with some dread head disease. Upon exiting the cave entrance I couldn’t believe how the weather had apparently changed. Gone was the 100 F day. The ambient temperature felt more like a springlike 65 F. I made a bee line towards the doors and the sunlight where I was hoping to catch a little natural warmth. Perhaps half an hour later, after my travel companions had raided the gift shop, it started to dawn on me that I had just experienced hypothermia. My teeth didn’t stop chattering until we were back in our hot car where I refused to open the windows or use the car AC system. It took me almost two hours to “feel normal” again. This was followed my elevated thirst and hunger. Nothing like learning the hard way about getting chilled to the bone! Dimitri – What an experience. You are fortunate you were in the company of others but I am surprised no one noticed that something was wrong. Thankfully, all turned out okay. Just a heads up, if you notice someone experiencing many of these same symptoms and the temperature is normal for the season, they may be in need of the same treatment. You see, in a disaster situation, w/o the needed meds, someone with low thyroid can experience the same thing even down to chills and trembling. And yes, there is danger w/o treatment with low thyroid too. Again, same treatment until they seem lucid again.